One of my favorite things about going to bookstores is discovering a new favorite book purely by happenstance. That’s precisely the way I ran across “The Goldilocks Variations”. I was browsing in the children’s section of one of my favorite bookstores when I decided to check out the picture-book aisle. Even though my children have long outgrown picture books, I’m always looking for exceptional titles to add to my collection. Plus, there’s the thought of grandchildren in the future–a distant future hopefully, but still out there. The whimsical cover artwork caught my attention, and when I saw the author was Allan Ahlberg, one of my favorites, I had to pull it off the shelf for a closer look. This is a book you should absolutely have in your library, whtether you have picture-book-age children or not. Who would have thought the old tale of Goldilocks and the Three Bears could be so fresh and delightful! We all know the original story I’m sure, but only Ahlberg could come up with such variations as Goldilocks and the 33 Bears, Goldilocks and the Furniture, or Goldilocks and the Bliim. Bliim are space creatures, if you were wondering. Goldilocks encounters other fairy-tale characters along the way, and the author even includes a book-within-a-book in the form of a play, complete with audience responses. The illustrations are lovely watercolors, and the book is chock full of interactive parts, such as pull-tabs and pop-ups, on every page. Young children will love it for these features alone, and the British wit of the writing will appeal to older kids as well as adults. It’s perfect for reading aloud, with made-up words like spoolz, snopperink, woodootog, and boozl. The play is especially good for children to take parts, using fun voices for the different characters. It is in the form of a pantomime, and has characters throwing sweets into the audience at one point. Really great fun! But don’t take my word for it when you can see it in person. Here is a video that will give you the full, immersive experience the book deserves. Enjoy! I’ve struggled in writing this post, mainly because so much of the humor and atmosphere in the book just doesn’t come across in a simple synopsis. Nesbit’s writing is engaging even in today’s world, and since this book was written in 1902, that’s saying something. The fact that it’s never been out of print since it was first published says more than I can hope to get across in a few words. Since it was written in a much different world than we live in today, be prepared for a touch of political incorrectness, although nothing disturbing enough to detract from the otherwise wonderful qualities of this story. Add to that fact that it’s written by a British author and populated by British characters, so some of today’s children might have a hard time relating to the story in places. That being said, it remains a glorious tale of magic and adventure, and that, all children can relate to. The book centers around five children (obviously), siblings named Robert, Anthea, Cyril, Jane, and baby brother, the Lamb. The “it” of the title is a disgruntled sand fairy, or Psammead, the children discover while digging in a sand pit near their home. When they discover it is required to grant their wishes, they are overjoyed, but apparently, they have never heard the phrase “be careful what you wish for.” Disgruntled may be too gentle a term to describe the Psammead’s disposition; it gets thoroughly disagreeable several times during the book and seems to take a perverse pleasure in knowing that the children’s wishes won’t always be the marvelous adventures they’re hoping for. Aside from the Psammead’s prickly nature, it’s not much to look at either. “Its eyes were on long horns like a snail’s eyes, and it could move them in and out like telescopes; it had ears like a bat’s ears, and its tubby body was shaped like a spider’s and covered with thick soft fur, its legs and arms were furry too, and it had hands and feet like a monkey’s.” Not exactly what you picture when you hear the word “fairy”, is it? Once the children finally convince the Psammead to come out of its bed of warm, dry sand, they learn that it has lived there for several thousand years, enjoying a nice long sleep and resting up from the days when sand fairies were plentiful and all the people used them for wishing on a regular basis. Of course, the children are delighted to learn that it can still grant wishes, but when forced to come up with a wish on the spur of the moment, “…be quick about it. I’m tired of you”, they can’t think of a thing. Seeing that the Psammead is about to burrow back into its warm home, Anthea blurts out a private wish of her own. The Psammead pushes out its eyes, holds its breath, and swells itself out till it is twice as fat and furry as before, but finally lets out a big sigh and declares itself out of practice. After coming to an agreement that the children will ask for no more than one wish a day among all of them, the Psammead gives their wish another try, and voila!, the book is off and running. If you are looking for an entertaining book that your children will enjoy, or if you feel like indulging the child inside and reading a children’s book yourself, this is an excellent choice. The story is great fun, and the writing is witty and tongue-in-cheek. Give it a try. You may discover your next favorite. Just a bit about me for new readers. This is a post from when I first started this blog. Reading and love of books has been part of who I am for as long as I can remember. I can’t remember a time when I didn’t love books. From the moment I was finally able to decipher all those squiggly lines on paper, I have been addicted to reading anything and everything I could get my hands on. My family didn’t have a lot of money for incidentals when I was growing up, but there was always enough for my mother to buy me a Little Golden Book every time she made a trip to the grocery store.I still have those little books, proudly displayed on my daughter’s bookshelf, along with her copies of Fancy Nancy and Junie B. Jones. In preparation for this week’s review of “Five Children and It”, I wanted to share this picture of my Folio Society boxed set of E. Nesbit’s magical trilogy, The Adventures of the Five Children. I could have picked any one of the three books to include in this writing series; they are all equally good and all three are favorites. What to do? What to do? In the end, I decided to choose the first in the trilogy, simply because it was the first book of Nesbit’s I ever read. I had good intentions of having the review ready for today’s post, but with school being out for the Columbus Day holiday, I chose to spend time with my daughter instead. I hope you’ll check back in later this week to read about this delightful book. Here’s hoping all of you had a great Monday! I’m short on time tonight, but I wanted to share a picture of my children’s bookshelf. It’s taken many years to put this collection together, and it never fails to make me smile when I pass by. I’m going to cheat a bit today and reblog a post from January, 2015. It’s actually a perfect post for the series, and the timing is just right. I had planned to write about several of this author’s books anyway, as she is one of my favorites. I hope everyone has a great weekend with the opportunity to do lots of reading! If you were a reader as a child, I’m sure you had a favorite author whose books you just could not wait to get your hands on. If not a favorite author, then at least there was probably a particular genre of books that you found yourself drawn to over and over again. For me, that genre was fantasy, or more particularly magic, and the author was E. Nesbit. 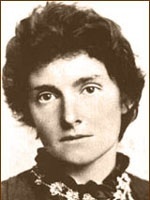 If you aren’t familiar with E. Nesbit, it isn’t all that surprising. Edith Nesbit Bland, born in 1858 in Kennington, Surrey (now part of Greater London), had been dead about 50 years when I first discovered her books in the mid-1970s. As it happened, I only found her then through an author I already knew and loved, Edward Eager. If you aren’t familiar with Mr. Eager, I’ll make the introductions in a future post.